This entry was posted on January 25, 2019 at 2:04 AM and is filed under the bad. You can follow any responses to this entry through the RSS 2.0 feed. Responses are currently closed, but you can trackback from your own site. Disappointing. Because I know what I saw in Ode to my Father. I know this is only a short teaser and the main intention is to highlight Salman in his usual avatar and bring his fans on board. I may be harsh criticising it. However, Ode to my Father seems to be at another level in terms of quality of cinema shown here. I liked the teaser. Havent seen Ode to my Father. But the trailer looked different, large scale. In spite of outbursts of indignation / resentment to last few releases, this Kahn is going to get bums on seat with this one again….some sort of redemption toward content based personage / personality. Nice BGM which is an essential for theater experience and hopefully Ali Abbas will once again bridge the gap and blend the pulse of the audience with the pulse of his fans. #BharatKaTeaser impact is so powerful that people have forgotten that some new movies have released today in the theatres. #BharatKaTeaser: @BeingSalmanKhan has left us in awe with his FIVE different looks! Jab first name Bharat ho, toh uske aage koi bhi surname kam hi lagega! This looks good. Should be another winner from this actor-director combo. Salman will Bounce back with this film. Seems there is something for masses and classes in the film. Top of that Ali abbas Zafar is decent director. All of his films are HIT. Going by the synopsis of the original ‘Ode to My Father’, waiting for a nice human story laced with emotions to unfold here. I hope it’s not in the Bajrangi / Tubelight domain and Salman gets out of those oversimplified characters. It’s been ages we have seen a typical lost & found masala story. Since this is going back in time, I trust Ali Zafar who comes from the Kaala Patthar / Trishul / Deewar school of thoughts is able to transform the visuals to the action, crime, and drama of that era. 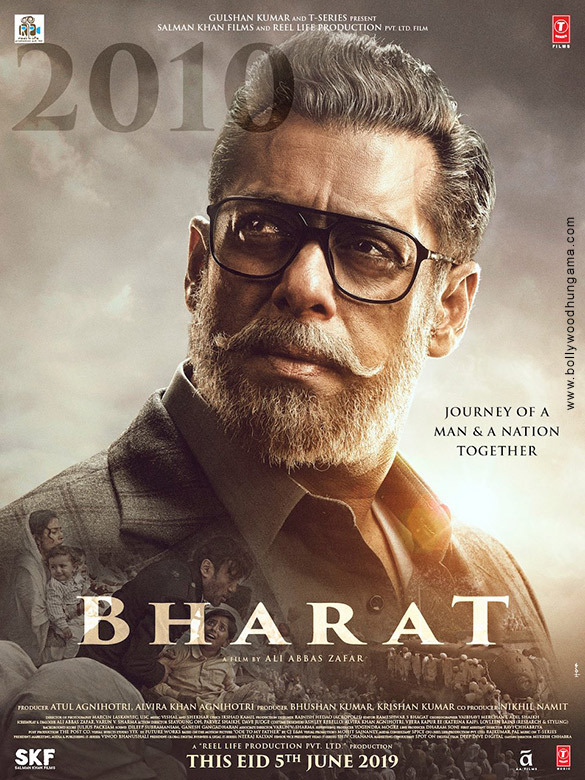 I feel Salman has his own thing to be convincing with the part he plays and that’s why he has lasted so long unlike so many clones couldn’t stay afloat. But boy if he is able to get this one right he will truly enter the annals of history. Ideally Aamir / Hirani would have been perfect to bring the essence of this story out correctly but I have faith in Ali Abbas based on the last 4 movies he has done. More importantly they have been working on the script so it does not seem like a rushed product….fingers crossed ! I watched a few clips of ‘Ode To My Father’ the one Bharat is adapted from on YouTube and story line seems very touching. Even if we are not living through the war times now even in this modern world families are torn apart because of something or the other whether it’s the usual bread and butter / livelihood or family tensions. When you lose someone in your family that’s when you realize the worth of family / blood relations – only constant in life till the end.